It is with great regret that Rodale Institute must cancel the 10th annual Organic AppleFest, originally slated for September 15, due to crop failure. Next year’s Organic AppleFest will take place on September 21, 2019. Apples are arguably the hardest crop to grow organically, especially in a humid, temperate climate such as the northeast United States. There are a host of weeds, insect pests, and fungal and bacterial diseases that are worsened during periods of cool, wet weather. The names of these diseases are in line with the symptoms they inflict: scab, rust, fireblight, sooty blotch. Conventional farmers rely heavily on chemicals to control these diseases and other threats. USDA reports consistently place apples at the top of the Environmental Working Groups Dirty Dozen TM list of the most contaminated fruits and vegetables (over 90% of samples contain pesticide residue and average 4.4 different chemicals [i]). Conventional growers use these chemicals to produce a blemish-free apple that shoppers demand at a price they’re willing to pay. Organic growers, however, must find other methods to produce a marketable crop. This year at the Rodale Institute we have had consistently cool, wet weather conditions that included heavy rains perfect for the development and spread of most or all apple diseases. This led to a near-complete crop failure. For obvious reasons, this is discouraging to the staff who have diligently worked hard to maintain the orchard and fight weeds, insects and diseases. However, we can be encouraged by the commitment Rodale Institute has made to advancing organic apple production. Rodale Institute has put a line in the sand and said we will not use synthetic chemicals even if it means blemished apples, increased costs, and the worst nightmare a farmer faces: complete crop failure. Rodale Institute is committed to developing chemical-free, regenerative organic methods for growing crops that improve the health and well-being of people and the planet. We’ve been committed to our mission for over 70 years. 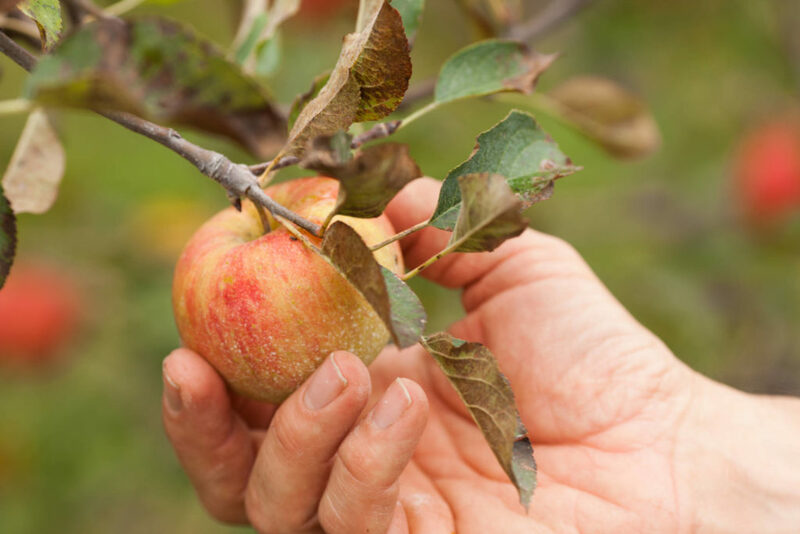 Despite solid research and demonstration that organic apple production is possible, Rodale Institute stands with just a handful of organic apple growers in the northeastern United States. This is why we do the research we do—to help farmers produce a viable crop without the use of chemicals despite pests, disease, and extreme weather. Organic AppleFest has always been a special opportunity for the community to come together and enjoy the season. It’s also an important fundraiser for our organization. We ask for your support as we double down on our efforts to find solutions for organic farmers. Consider a gift to Rodale Institute today. Next year’s Organic AppleFest is slated for September 21, 2019. We can’t wait to see you there! Our annual Organic Apple Festival is now Fall on the farm and spans over a few weekends in September and October.